Customer feedback is a powerful source of ideas for new features but tapping into it can be hard. Shopseen is a web application that manages commerce channels for independent merchants. It integrates with major online marketplaces, like Etsy, eBay, Shopify, and Storenvy as well as point-of-sale systems like Square. Shopseen also lets merchants create listings on any of these channels and takes care of inventory management and order fulfillment. 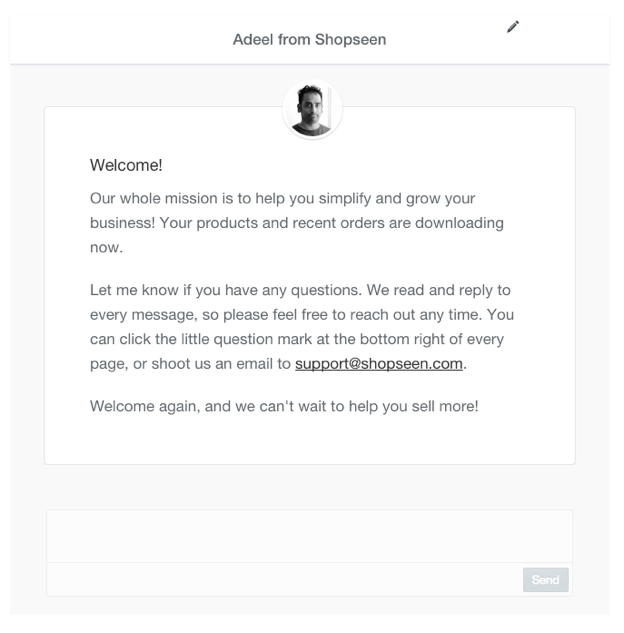 With a focus on the long-term success of its customers, Shopseen uses Intercom to constantly engage with its most active users for feedback and product ideas. The goal, to borrow Des’s Henry Ford analogy, isn’t just to make a “faster horse”, it’s to make a car. 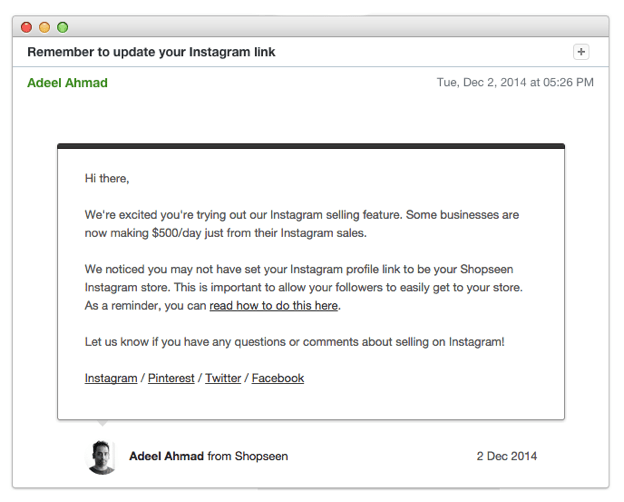 Here’s how founder Adeel Ahmad (pictured above with senior software engineer, Scott Fryxell) used Intercom to absorb feedback from his customers, while iterating on one of Shopseen’s most popular features to date, an Instagram-based sales channel. If life is good, your product often begins with the worst kind of beta testers: your friends. To them, everything you make is awesome and useful and will crush the market. This is more or less the support I got when Shopseen began back in 2013. I was working in a vintage shop in San Francisco, Vacation SF, and I saw the store’s owner Kristen really struggle to run her brick and mortar store while managing online sales – a huge potential source of income for independent owners. Shopseen was created for people like her. Pretty soon I began working full-time on Shopseen, and within a year we were supporting thousands of other independent store owners like her. Like a lot of early startups I’d invested in a bag of tools to communicate with our customers: Mixpanel, Olark, Zendesk, Mailchimp. None of them gave me the insight into our customers that I really craved. So upon a friend’s advice, we installed Intercom earlier this year. The main dashboard told us so much about our customers. We could quickly scroll across and see where our users came from, when they signed up, which integrations were being used the most, how much they made from each platform. After importing Stripe data, we could also see who was paying the bills for us too. It was eye-opening to learn that half our active customers were from outside the US. One of the first actions we took from this insight was to give store owners support for more currencies. Coinciding with this, we began using Intercom to “talk” to our customers through the in-app messenger. We set up a drip feed during the onboarding process, and I was pleasantly surprised to see people actually respond to my welcome in-app message as if it was a personal one. The in-app messenger was a really easy way to get raw, in-the-moment reactions to product announcements. The most common question we received was “how do I get more sales?” and through numerous conversations that began this way, we learned that many of our customers actively promote their goods through social media. And they are extremely active on Instagram, as are their followers. We began tagging conversations that mentioned Instagram: around 180. So that’s where the Instagram commerce idea came about. We built an MVP pretty quickly, and through Intercom invited our most active customers to join our first beta program. Intercom makes it incredibly easy to target the right customers for feedback and send in-app messages to them right away, while they’re using our application. By the end of the process, we felt an unusual sense of confidence that this feature would do well. It’s only been a few months since the public release but 20% of end users have integrated with Instagram. And so far, it’s brought in a healthy revenue for some of our most engaged customers. Our best performers are making almost half their online sales from Instagram, and when online sales usually make up 10% of total sales, that’s a pretty significant testament to this channel. Here’s what the checkout experience looks like from one of our most successful customers, Vintage Heirloom. I think the best part about Intercom is that we can manage the pre- and post-launch process in one tool. Even post-launch we’ve been able to keep working with our best beta testers to improve the feature. What Intercom has really done is taken our hodgepodge of point solutions and made it easy for us to talk to our customers personally and at scale. We still use Mixpanel too for data-centric purposes like spotting overall trends on behavior (like creating listings, scheduling social media posts, etc., plus viewing funnels), but communication-centric things are all done through Intercom. We could do some notifications from Mixpanel if we wanted but with Intercom it feels more like you’re developing a relationship with the customer than just reacting to a data point. We need the relationship with customers because they will have more questions or feedback. We’ll spend more and more time in Intercom itself as we start tracking more data in there. With Intercom getting customer feedback is a piece of cake – it’s up to you build it into your product roadmap. Like to find out more?